Many folks have time-honored MSU sports-watching tradition, and we here at TOSSS are no different. Ours may just be a bit more appetizing. See, whenever we go to or watch a significant MSU sports game, we've got to get a victory burrito ahead of time. Before MSU's 2001 victory over Michigan, it was Panchero's in East Lansing. Before the 2007 basketball home win over then-number one Wisconsin, it was Qdoba. And before I watched MSU cruise past Kansas in the Sweet Sixteen, the victory burrito craving was satisfied by the great folks at Chipotle in the Dupont Circle neighborhood of Washington D.C.
Those who haven't ventured outside of Michigan might not know of Moe's, but it's famous in other parts, particularly in the South. The emphasis here is on personality - each burrito has its own name (mine is the Joey Bag O' Donuts, still no clue why). The sauces are spectacular, and this is probably the only hot sauce where I don't dare ask for extra. Extra bonus: Tortilla chips are on the house. This is where I let my fiancee's preferences show. She's a big fan of the veggies, and Qdoba's probably tops in that market. Their queso cheese is also top class, though it can make for a very soggy burrito if you're a meat-cheese-beans-no veg kind of person. On the down side, the salsas can be oily, and the pre-made tortillas won't soak that up. These tortillas will, however, and not just that but they're about the best you'll get around. They're pressed fresh, rather than steamed as you get there, which gets very high marks in our book. The meats are solid, though generally not spectacular. But their hot salsa, oh my word, it's amazing. And that secret "Diablo" sauce that used to be under the counter was the stuff of legends. 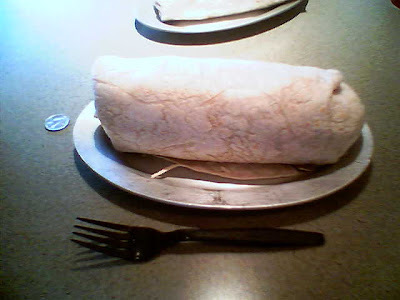 Add some extra points for Panchero's in that it's the only big chain where you can get the "El Gordo", for when the half pound of burrito just won't cut it. I can't pick Moe's because, well, there's not one in East Lansing. There is one in Ann Arbor, but on this blog that counts against you. Panchero's has the edge on Qdoba and Chipotle because of its fresh-pressed tortillas, which is no doubt enough to win. However, it's also the only burrito location inside Spartan Stadium itself, and that's exactly the sort of dedication a true Spartan victory burrito maker needs. This challenge isn't close. Easy win for Panchero's, the true victory burrito.